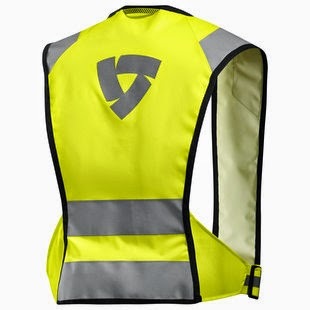 I needed a hi-viz vest for my new Aerostich Transit jacket, but I couldn't use the Rev'It Athos vest I use on my Rev'It Ignition 2 jacket because the side panels would completely block the underarm vents on the Transit. After some searching, I decided to try the Connector vest. The Connector's side pieces only overlap the pit vents by maybe 10%, which I'm not sure actually blocks any airflow in actual use, and the mesh back panel doesn't seem to restrict air outflow from the Transit's large rear vent. The outer chest pocket is blocked (that pocket is fairly useless anyway), but the vertical "hand-warmer" pockets aren't. Rev'It needs to supply better product images: the fabric IS mesh (better! ), not solid, and the color is more akin to the Athos' bright green-yellow (again, better!) the really "pops" against a black jacket. Also, be aware that the vest isn't as long as it may seem in the images; it only extends to about mid-chest/back. I don't think any "missing" length would be easily visible to other motorists, anyway, particularly on the front. Though made specifically for some of Rev'It's newer jacket models that incorporate connectors ("Connector," get it?) on their fronts, the vest also incorporates a simple secondary connection system using Velcro and a fabric loop, so it can be used on just about any jacket on the market. However, the non-Rev'It connection system won't prevent the vest from slipping off the shoulders when donning/doffing the jacket, although it falls off much less than a few other safety vests I've owned. The Connector's side pieces are made of elastic, and are adjustable. On the road, the vest stays in place, without buffeting or flapping, and I only know it's even there when I have to unfasten it to unzip my jacket. You'll want to cut off the tag at the top rear of the vest to prevent it from flapping in the breeze. As for sizing, I took the advice of Revzilla's reviewers and ordered down, selecting a Medium for my US 42 (Euro 52) jacket, and it fits just fine. 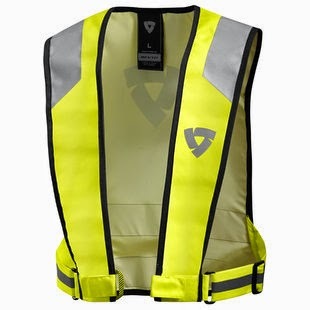 Coincidentally, today my secretary said she saw me in traffic yesterday, and without prompting, said she noticed the vest even before noticing my bright yellow motorcycle. Yeah, that's why I wear hi-viz; it may be a nerdy look, but I can't imagine I'd look cool in a body cast, either.